For many marketers, demand generation immediately conjures up thoughts of massively expensive branding campaigns with clever TV spots, full-page magazine placements, and aggressive radio coverage. Saavy marketers are discovering a great alternative to expensive offline demand gen - digital demand generation. Search engines like Google now offer a host of demand generation-focused solutions that can drive incredible awareness of your products and services, but at a measurable and affordable price. 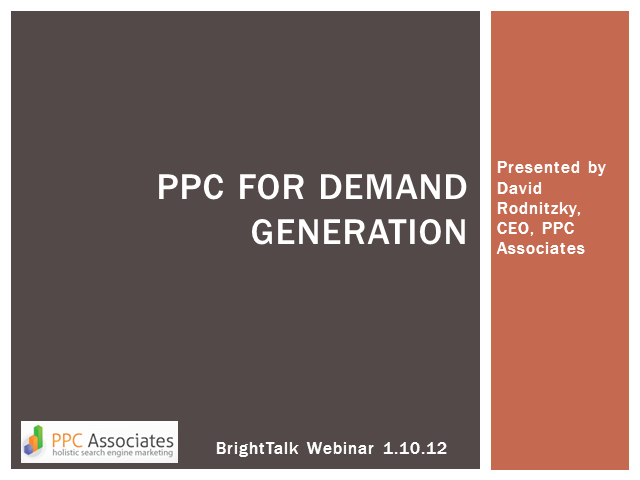 This webinar provides tactical tips and tricks to drive demand generation through SEM.